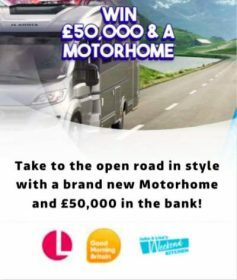 Win a Motorhome and £50,000 in Cash with Good Morning Britain and Lorraine on ITV ~ Free Entry TV Competitions UK. Lorraine Motorhome competition ITV includes £50,000 cash. Latest prizes: Loose Women £50,000, The Voice, £35,000 and VW campervan. No payment required.